Coming as one of the most top quality hair suppliers in the market, MCSARA have being high evaluated by customers around the global. We have being brought hair extensions with 4 years of experiences. By bringing the very great ways that can give ladies over the world more appealing hairdos. MCSARA has been proud with our high rate products as well as services in conveniently. 8 inches tape in hair extensions are customers choices whenever wanting to get a pretty hair in a pretty fast ways. Our tape hair has been sourced by 100% Vietnam Remy hair. Since the hair is natural Remy, they are durable with no tangle or shedding. 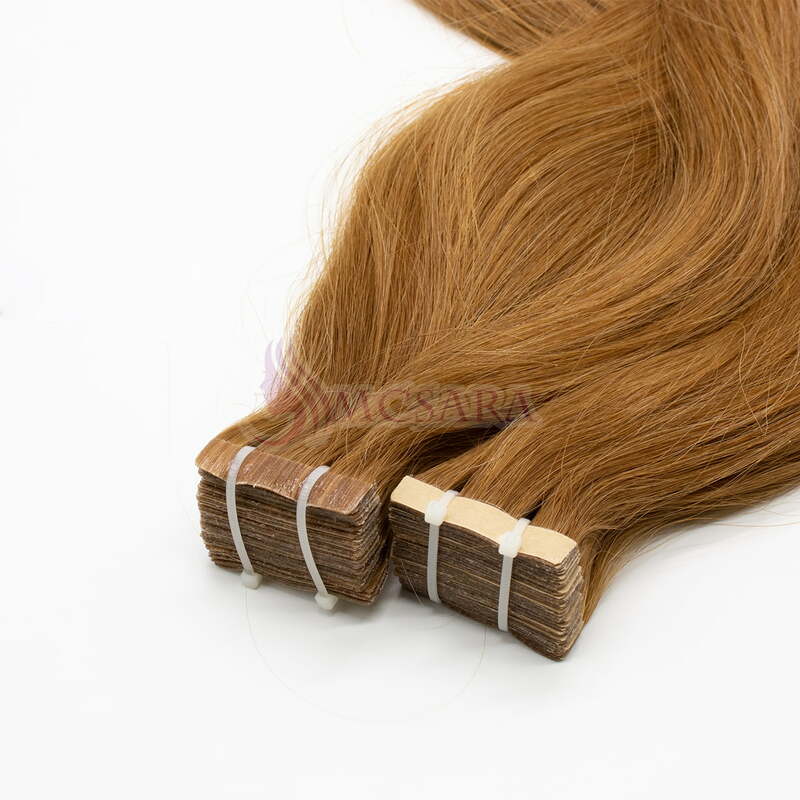 The Remy tape hair extensions are natural human original, so that they get totally no harm for any user. Our 8 inch tape in hair are also can use in easy way at the same time can store simply by some basics steps. Earning a wonderful elegant hair looks are more possible with MCSARA human hair extensions. With the passion that unchanging through years, we formed the 8 inches tape in hair many diversity kinds. They are shinning, smooth as your real hair. We can create a wide range of hairs in numerous ways. Just by natural methods, we have wavy tape hair, curly tape hair or just natural straight hair. All are easy to find in various shades of color. Choosing tape hair extensions will be your very first step to lay on the wonderland with uncountable fabulous charming hairstyles. Your choices of getting various hairdos will be boarded with MCSARA hair products. With the 8 inches tape hair extensions, we have all the length from short to long as 10 inch tape hair extensions to 30 inch hair extensions. As one of best quality human natural hair sources, our tape hairs are silky soft yet trending in the fashion. Using tape hair extensions will open your way of achieving any long length of your dream stunning style. As one of the top hair products that searching by customers, 8 inches tape in hair extensions are taking the lead now. By understand its strong and weak points, you will have the ability to using them in the most effective way. Your tape hair extensions will have longer lifespan and remaining in good conditions. 6. Brush straighter hair in a downward motion straight hair with the ends. Work your way up to the roots. 7. Certain items should not be brushed. EG braids, domes, ETC. Consult your hair stylist if in doubt.